One of the most fundamental distinctions in nature is the one between unicellular and multicellular organisms. Multicellular organisms, like humans, can perform a wide specter of different tasks due to the highly ordered and differentiated system of cells. This ability is lacking from the simpler unicellular organisms like E. coli. But is it possible to build complex ordered structures from bacteria? Is it possible to manipulate E.coli to become artificially multicellular? 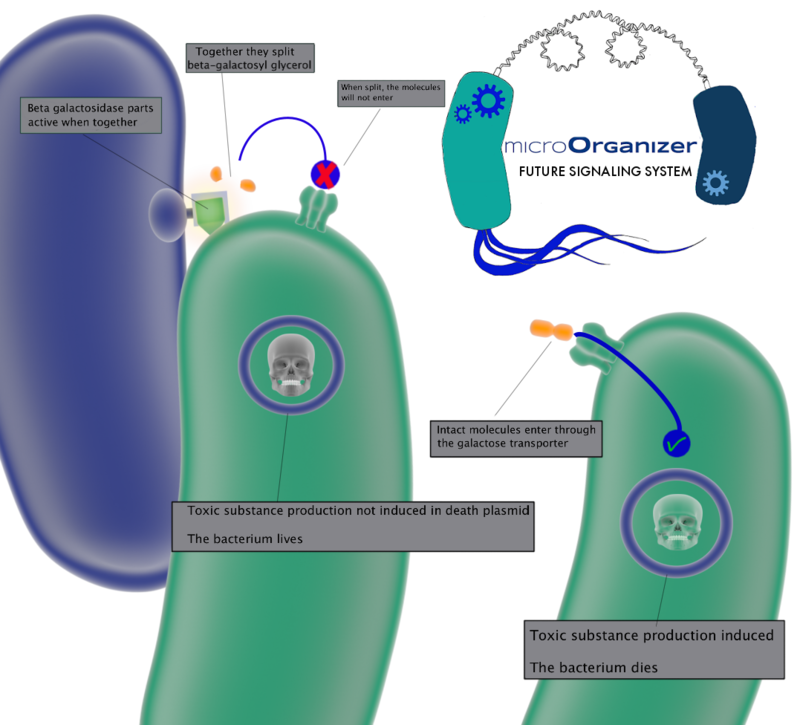 The UiO Oslo iGEM team has taken the challenge and is aiming to build a microOrganizer – a system for organizing E. coli in a predetermined way. In our project we are trying to create BioBricks that gives E. coli the ability to bind physically to other bacteria and transfer a signal to the inside of the bacteria about its binding state. This signal can then be used to select for only those bacteria that have bound to each other in the correct configuration. This will make it possible to build and preserve any desired configuration of different bacteria. Thus bacteria can be units in even more complex genetically engineered machines where each type of bacteria has its own function and location in complex multistep procedures. The system should have a wide variety of applications and could be used in for instance biological manufacturing, remediation processes, and biocomputers. So what kinds of BioBricks could possibly fulfill these tasks? The answer is split enzymes coupled to autotransporter proteins from E. coli. Split enzymes are enzymes consisting of two or more separated parts that will only work when they are assembled correctly. The enzyme parts also have a natural affinity for each other and can assemble and give activity in solution. By expressing different parts of the enzyme on the surface of different bacteria, the bacteria will have a unique surface identity and the potential to bind to the bacteria with the matching enzyme part. Only interacting bacteria will give enzyme activity and this activity can be used to select against unbound bacteria by inducing or inhibiting the bacterias gene expression. The autotransporter makes sure the enzyme parts are presented and attached to the bacterial surface. Want to know more about our project? Continue reading on our Project Details page.